Love making new friends? Looking to pick up? Your local casino is a great place to start. 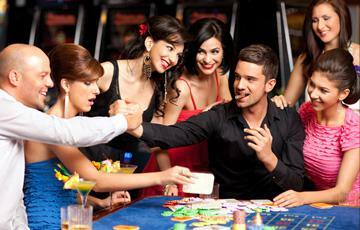 Casinos tend to be incredibly social – assuming you know which games to play. If you park yourself in front of a slot machine, there’s a good chance the only friends you’ll be making is the cocktail waitress who just wants your tips. But if you select the right games, you could make new friends for your casino weekend away or even find the love of your life. We’ll show you which games to play right now. This casino game is amazingly social. People are gathered around the table chatting away, betting on numbers, and encouraging the roller. If you’re standing next to them, you could find yourself high-fiving them (or hugging them if that’s your thing) with every successful roll. And when the luck runs out, you can continue the fun and chat away with them at other tables. These tables tend to be crowded, so you’ve got plenty of opportunities to meet new people and strike up a conversation. The great thing about Roulette is that you often have several minutes between spins as bets are paid out, the table is cleared, and players are given new chances to place more bets. So use that time to strike up a conversation and make some new friends. We normally don’t recommend playing slot machines if you want to chat up new friends. But busy slot machines are the exception to the rule, particularly busy slot machines with crazy-big jackpots. If you find a single machine with a large lineup, get in line – even if you don’t intend to play. It’s easy to start a conversation and meet new friends by identifying with their desire to pop a huge jackpot. Remember, whatever game you’re playing, it’s easy to start a conversation. You already have something in common. You love casino games and you’re playing the same one at the same time. So go ahead and chat away.